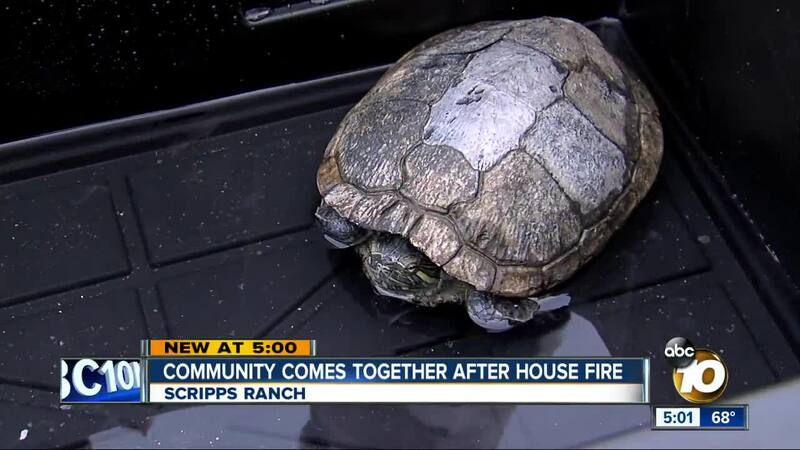 SAN DIEGO (KGTV) -- A 26-year-old turtle was rescued from a home in Scripps Ranch more than an hour after the house caught fire. According to firefighters, the fire broke out on the 10000 block of Caminito Alto around 9:15 am. Crews say the fire started in the garage, but the exact cause is unknown at this time. One man was home at the time of the fire. He was alerted by smoke alarms inside the home and ran outside barefoot. Caring neighbors offered the survivor smoothies and even a brand new pair of shoes. Firefighters were able to extinguish the flames within about 30 minutes. Roughly an hour and a half later, the 26-year-old turtle was discovered beneath ash. The turtle survived, escaping with some damage to its shell. The homeowners told 10News that in the Chinese culture, turtles symbolize good fortune and longevity in life. The say they’ve lived in the house for more than 20 years.